❤ GUYS. SCHOOL IS BACK ;n; I WILL BE MORE INACTIVE, SORRY. PLEASE DON'T NE MAD! ITS ALMOST OVER! 4TH QUARTER!! sometimes i forget to change it. so don't be too confused. Chat, RP and do random things goal- 100+ projects? 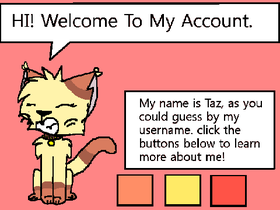 THIS IS THE OFFICIAL -TAZ FANCLUB!